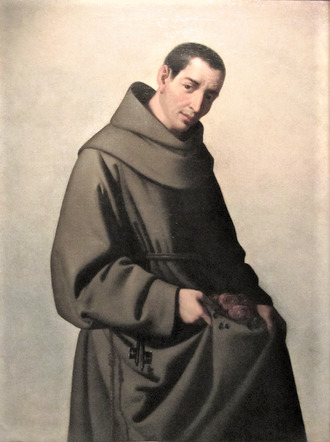 A humble lay-brother, Didacus of St. Nioholas, is welcomed to-day by his father St. Francis into the company of Bernardino of Siena and John Capistran, who preceded him by a few years to heaven. The two latter left Italy and the whole of Europe still echoing with their voices, the one making peace between cities in the name of the Lord Jesus, the other urging on the Christian hosts to battle with the victorious Crescent. The age which they contributed so powerfully to save from the results of the great schism and to restore to its Christian destinies, knew little of Didacus but his unbounded charity. It was the year of the great Jubilee, 1450. Rome having become once more, practically as well as theoretically, the holy city in the eyes of the nations, not even the most terrible scourges could keep her children at a distance. From every quarter of the globe, crowds, urged by the evils of the time, flocked to the sources of salvation; and Satan's work of ruin was retarded by seventy years. Men doubtless attributed but a very small share of such results to the humble brother, who was spending himself in the Ara-Cœli, in the service of the plague-stricken; especially if they compared him with his brethren, the great Franciscan apostles. And yet the Church pays to Didacus to-day the very same honours as we have seen her pay to Bernardine and John Capistran. What is this but asserting that before God heroic acts of hidden virtue are not inferior to the noble deeds that dazzle the world, if, proceeding from the same ardent love, they produce in the soul the same increase of divine charity. The Pontificate of Nioholas V, which witnessed the imposing concourse of people to the tombs of the Apostles in 1450, was also, and still is, justly admired for the new impetus given to the culture of letters and the arts in Rome; for it belongs to the Church to adorn herself, for the honour of her Spouse, with all that men rightly deem great and beautiful. Nevertheless, who is there now of all the humanists, as the learned men of that age were called, who would not prefer the glory of the poor, unlettered Friar Minor, to that which vainly held out to them the hope of immortality? In the fifteenth century, as at all other times, God chose the foolish and the weak to confound the wise and the strong. The Gospel is always in the right. Didacus was a Spaniard [this name is merely a Latin form of the Spanish Diego, i.e. James], born at the little town of St. Nicholas de Porto in the diocese of Seville. From his early youth he began the practice of a perfect life, under the guidance of a pious priest in a solitary church. Then, in order to bind himself more closely to God, he made profession of the rule of St. Francis, in the convent of the Observantine Friars Minor at Arizzafa. There he bore the yoke of humble obedience and regular observance with great alacrity; and devoted himself especially to contemplation, in which he received wonderful lights from God, so that, illiterate as he was, he spoke of heavenly things in an admirable manner, evidently by a divine gift.